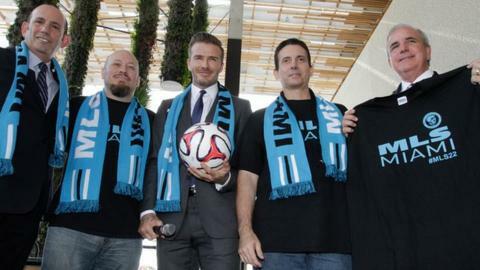 David Beckham's plans to create a team in Miami have edged a step closer after a site for the franchise's stadium was approved by Major League Soccer. The former England captain's team of investors acquired land in the city's Overtown neighbourhood this week. It was the Beckham team's fourth attempt to buy a suitable Miami site. MLS commissioner Don Garber said Miami Beckham United's bid plans "for a world-class venue within the urban core" were "impressive". He added: "We are very supportive and look forward to working with David and his partners to finalise plans to bring Major League Soccer to Miami." Beckham's advisers inserted a clause into his contract when he signed for Los Angeles Galaxy in 2007 that would allow him to create his own MLS franchise. The former Manchester United midfielder hopes to turn Miami Beckham United into a super-club with the financial clout of Manchester City and Paris St-Germain and aims to attract the world's top players. Meanwhile, the MLS board has said it supports expansion of the league to 28 clubs. The league's current plans are to expand from 20 to 24 teams by 2020. "There is no shortage of demand for MLS expansion teams and we believe the opportunity exists to grow beyond our current plans," said Garber.